The country's second largest software exporter Infosys will spend $10 million from its global innovation fund to invest in Ireland-based startups, the company said today. Though Infosys did not reveal the type of startups it will pursue, the innovation fund's mandate is to put money in the emerging areas of artificial intelligence (AI), automation, Internet of Things or IoT, collaboration and design. "Our investment in the Irish startup community reflects our belief that Ireland is a strong and vibrant nation, home to entrepreneurs who share our vision of technology as a way to drive growth," Mohit Joshi, executive vice president, global head of financial services, Infosys, said in a press statement. The move comes as part of Infosys' alliance with Allied Irish Banks, p.l.c. (AIB), a financial services group operating predominantly in Ireland and the United Kingdom. Infosys has been signed up by AIB to provide the latter with application development, application management and others services, , the Bangalore-based company said. Infosys intends to set up a 200-seater facility in Dublin to house employees who will be transferred to its rolls from AIB as part of the deal. The centre will also cater to employees who will be appointed locally following Infosys' recent deal wins from the region. "We will leverage our broad experience in financial services and other industries to support the digital transformation journey and strategic growth plans of AIB," said Joshi. The $500 million global innovation fund was launched by Infosys to focus on ideas, products and platforms. Earlier this year, Infosys had expanded the size and scope of this fund to $500 million from $100 million. In fact, the formation of the innovation fund was one of the first major steps that chief executive Vishal Sikka undertook after taking over the corner office at Infosys last year. The first investment from this fund was $15 million in a spin-off from California-based Dreamworks Animation in February. The name of that venture was not disclosed. Infosys had also pumped in $2 million in US-based personal air quality monitor Airviz in April this year for picking up a minority stake. Airviz Speck, an affordable, fine particulate monitor, which uses patent-pending technology from Carnegie Mellon University, can assist in identifying health hazards related to air quality. The outsourcing giant also intends to invest in India-based startups. The company has set up a $250 million 'Innovate in India Fund' for home-grown startups. It may be recalled that Infosys had acquired m-commerce enabler Kallidus Inc for $120 million in April as part of an all-cash deal. Two months before this deal, the company had acquired Israeli automation technology provider Panaya for $200 million. 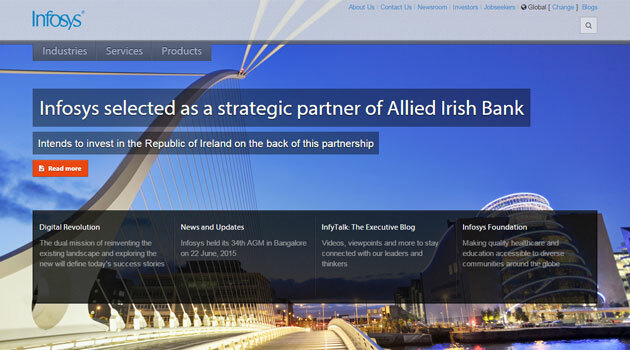 Allied Irish Banks Infosys Ltd.